Do you have your Senior Discount Card yet??? Attention Riders with Traditional Medicaid! 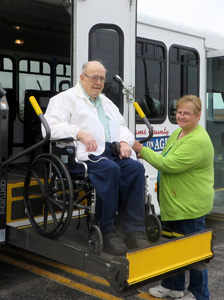 The mission of the Adams County Council on Aging is to promote a healthy, independent, quality lifestyle for all senior citizens throughout Adams County. The Adams County Council on Aging will serve as a focal point for networking appropriate social service, government and educational resources. 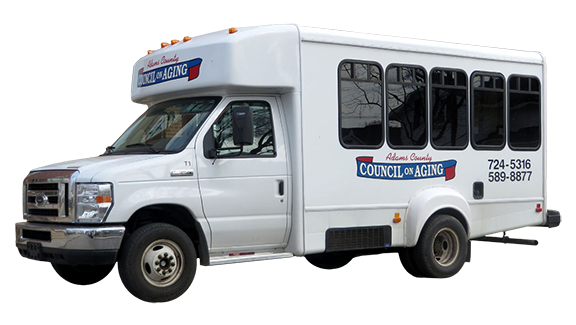 Van service is available throughout the Adams County area to Adams County residents who are 60 years of age and over and disabled adults. Appointments are scheduled by calling the Council on Aging office at 260-724-5316 which is open from 8:00 A.M. to 4:00 P.M. weekdays – Monday through Friday. Appointments should be made at least 48 hours in advance. 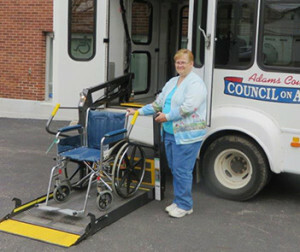 Three of the five vehicles are equipped to accommodate passengers who use a wheel-chair, or who need to board the van by means of a ramp or lift. The driver will come to the door of your residence to pick you up and will deliver you to the door at your destination. The driver does not stay with you at your appointment. The Older Americans Act of 1965 was established by Congress to assist older Americans in securing opportunities for employment, the pursuit of meaningful activities, physical and mental health services and to enable them to remain independent as long as possible and to enrich their retirement years. Under the guidelines of this Congressional Act, Adams County Council on Aging has developed a network of services and programs offered to all those 60 years or older. Partial funding is provided by Aging and In-Home Services of Northeast Indiana through Title IIIB of the Older Americans Act, Social Service Block Grant Funds and the CHOICE program. Donations and contributions are greatly appreciated. Funding is also received from the Adams County Commissioners, City of Decatur, City of Berne, Town of Geneva, the United Way of Adams County, Biggs, Inc, First Bank of Berne, St. Mary’s Decatur Fall Fest, First United Methodist Decatur Endowment fund and other local Foundations and Organizations.